Come walk with us along the back roads and footpaths of the stunning Tuscan countryside. Explore villages that seem caught in a medieval time-warp. Listen to the strains of a Puccini opera wafting from a small trattoria. Marvel at an archaeological site where you hear about the Etruscan civilisation dating back to the 9th century BC (long before the Roman empire). Wander through small towns and discover a treasure-trove of pastry shops and gelaterias. Walk in beautiful Tuscan countryside. 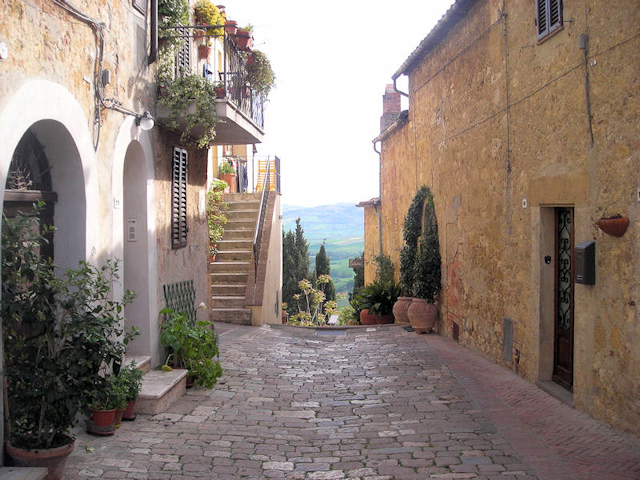 Discover villages like Pienza that have changed little since medieval times. Learn about ancient Etruscan civilization. Enjoy Italian food and wine. 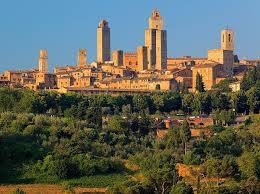 Visit the fabled town of Siena. This Tuscany holiday is a "single-centred" walking holiday staying at one hotel for a week. Our private bus takes us to the start of the walks and brings us back to our hotel at the end of the day. 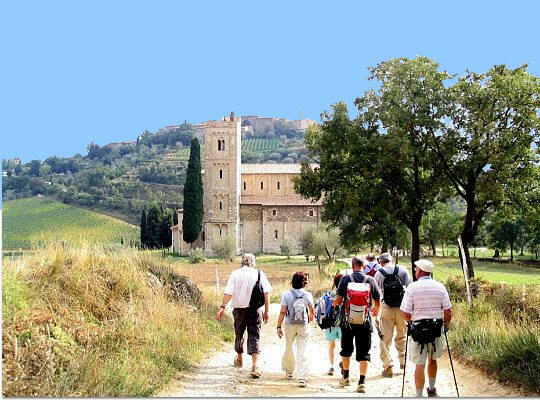 Guided rambles show us the best of Southern Tuscan countryside with time to explore fascinating villages and historic sites. Local professional guides are bilingual and love to show you their country. A variety of restaurants offer a chance to sample Tuscan cuisine. Having two guides means two levels of walking so you can choose your pace. Wine is included with dinners. Want a longer holiday? In September you can combine a week in Southern Tuscany with a week in Eastern Tuscany.